Gordon Donald designed this delightful home for Mrs. Emerson O. McLean in January of 1926. The home was featured in “Redlands ‘Twixt Mountains, Desert and the Sea”, published in 1927. Probably the most character defining features of the home are the steeped gables on the west and east elevations and the massive chimneys. This Old English Cottage was designed with English Tudor features and years later other Tudor features were added. The doubled-chimney home originally stood as the lone structure on a hill west of the Country Club. The subdivision was known as Country Club Park. The second family to occupy the home was the Parks family living there until they built their home across the street. The home was sold in 1940 to Gustave and Eva Cass Jahn. Gustave was a mining engineer and Eva became known as “Mrs. Republican ” by the Republican political party. According to the November 4, 1965 Redlands Daily Facts, Mrs. Jahn was honored for her party work and was the first woman to be named “Mrs. Republican” in California. Rumor has it that Richard Nixon made the decision to run for Governor at a meeting held in this home. Anne and Eugene Ouellette owned the home from 1968 until 1975. The Ouellettes added an attic skylight and upstairs air conditioning. On the main floor, they knocked out a closet and opened up a corridor leading to a bedroom creating a family room off the kitchen. According to Mrs. Ouellette, the home had its original gravity flow furnace in the basement. The current owners, the Brunicks, have retained this feature. Both families rave that it is the best heating system ever devised. In 1975 Claudia and William Brunick purchased the home and have enjoyed living there for the past 28 years. In 1978, needing more room for their growing family, they added a breakfast room, laundry room and pantry to the south side of the home. This addition created a natural patio area facing the west. In 1980 the Brunicks added a Tudor style back porch with a gabled roof, brick pillars on each side and brick steps. The front of the home faces north featuring a charming indented arched entranceway with a paneled wood door. West of the front door, a large window with 84 panes of glass faces the northerly mountain view. To the east of the front door is an Oriel window, which is a type of bay window, reminiscent in Gothic Revival and Tudor style architecture. 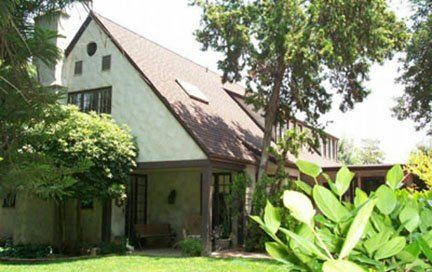 The Redlands Area Historical Society thanks William and Claudia Brunick for 28 years of outstanding stewardship of their lovely Old English Cottage. Researched and written by Liz Beguelin.